In 1977, while Secretary of the Department of Natural Resources and Community Development, I proposed the idea of a hiking trail stretching from the Great Smoky Mountains to the Outer Banks of North Carolina. Thus, the Mountains to Sea Trail. Almost 40 years later, more than 680 miles of trail are now complete and people are hiking the 1,150 miles across North Carolina. 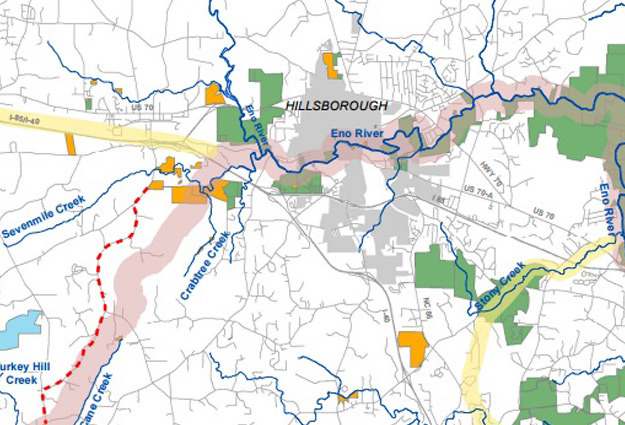 I’m very excited that the Orange Water and Sewer Authority board has voted to allow a segment of the Mountains to Sea Trail be built along the Cane Creek Reservoir in western Orange County, which will link Saxapahaw to Hillsborough. The MST, as we call it, encourages us to be outdoors, allows us to explore the state, and meet a variety of people and make new friends. The building of the trail has only been possible through the local governmental cooperation and a large crowd of volunteers organized by Friends of the MST. Some examples include 4 miles of the MST through downtown Hillsborough and 105 miles continuous through Durham and Wake Counties and stretching to Clayton. I feel confident that Orange County will follow through on defining the trail through the Cane Creek Reservoir property in accordance with OWASA’s perimeters. I’m absolutely delighted that this tremendously important segment of the MST is coming together in Orange County. I’m looking forward to personally hiking this segment as I continue hiking across the state. Perhaps, if I am lucky, I will meet some of you along the way on the MST.